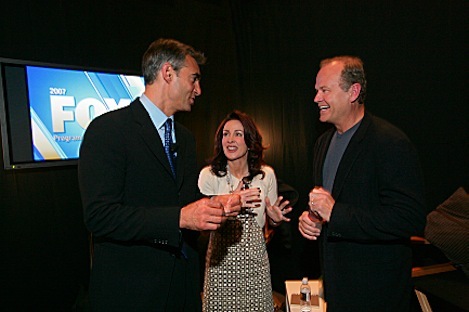 Fox entertainment president Peter Liguori gets happy with Patricia Heaton and Kelsey Grammer, who play TV anchors in Action News. ***Fox's 2007 program development roster, announced this week, includes a big-ticket sitcom starring Kelsey Grammer (Frasier, Cheers) and Patricia Heaton (Everybody Loves Raymond). They're playing a reunited anchor team in the tentatively titled Action News, an almost surefire addition to Fox's next fall lineup. Grammer plays "egomaniacal womanizer" Chuck Darling, who used to be a ratings hit in Pittsburgh with Kelly Carr (Heaton). He went to a larger market but hit the skids after a newsroom tirade hit the Internet (code name for YouTube). So Chuck crawls back to Pittsburgh to rejoin Kelly in hopes of taking their old newscast back to No. 1. Old reliable Fred Willard (Anchorman), is also in the cast as "endlessly inappropriate" sports anchor Marsh McGinley. ***Another prospective Fox comedy, The Hot Years, centers on a quartet of twentysomething hotties who "have more interest in great clothes and great parties than in meaningful relationships and fulfilling careers." The network also puts it like this: "Britney. Paris. Lindsay. When these are your role models, how does any girl ever learn how to grow up? Or cover up, for that matter?" Unmentioned is that Fox made a star of Hilton in The Simple Life. ***Graybeard Lee Majors will try to return to prime-time as himself in a sitcom called Me & Lee?. Premise: Majors has been obsessed with bionics since The Six Million Dollar Man left the air. Now he's ready to experiment on a young human guinea pig who's tricked into having far-flung experimental surgery in Majors' Beverly Hills Mansion laboratory. Surely this won't get on the air. Or will it? ***Fox's The Minister of Divine stars Kirstie Alley as a "chocolate-loving, joke-cracking lady pastor with a shady past." And Parker Posey plays an unfulfilled children's book editor in another proposed comedy, The Return of Jezebel James. ***On Fox's drama front, former ER star Julianna Margulies will try to get back in the prime-time game as a rising attorney in Canterbury's Law. Also, the creators of 24 are developing Company Man, in which "an everyman is pushed without warning into a brutal, Jack Bauer-esque world" of espionage. ***Sci Fi Channel has upped its Season 4 order of Battlestar Galactica from 13 to 22 episodes. The current season ends on Sunday (March 25), with the series scheduled to return in early 2008. ***The May 15 Academy of Country Music Awards on CBS will have a familiar host. Reba McEntire has been hired to preside for the ninth time, this time from the MGM Grand Garden Arena in Green Acres-esque Las Vegas.